Kneecap Instability | Podiatry Associates, P.C. When you “get into a groove” it means things are going along smoothly and productively. That’s certainly true of your patella, more commonly known as your kneecap. It moves up and down in a groove, called the trochlea, on the end of the thighbone. This is what allows you to bend your knee when you walk, run, jump, sit, squat—you get the picture. When your patella slips out of the groove, things don’t move along quite as smoothly. In fact, this often results in knee pain and instability, also called patella subluxation, which can definitely cut in to your productivity, not to mention your fun! Your kneecap connects your thigh muscles to your shin bone. As you bend and straighten your knee, the patella is pulled up and down—at least that’s what is supposed to happen. 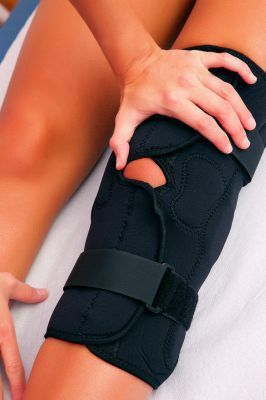 With kneecap instability, the kneecap is displaced, causing it to slip to the side, buckle, become stiff and painful, and feel as though it catches when you try to move. There may also be some swelling, and a creaking sound when your knee bends and straightens. Why Is It Slip-Sliding Away? This condition is often the result of a number of factors, including bone structure and gait abnormalities. A shallow or narrow groove can disallow the kneecap to stay on track. A sharp blow to the knee could pop the patella out of place. A wide pelvis can contribute to the problem as well. Typically seen in adolescents and children, the condition causes pain in the sides of the knee and discomfort with activity. Seeking medical help is advised, as knee pain can also be a sign of a condition called chondromalacia— often associated with patella subluxation. This is an irritation of the cartilage underneath the kneecap and needs to be treated separately. A thorough examination, including X-rays, will not only determine the severity of the problem, but also rule out other conditions such as osteoarthritis, patellar tendonitis, and ligament damage. If the kneecap has been completely dislocated from its groove, it must be returned to its proper position, a process called reduction. This can either happen spontaneously or by gentle force. With a partial dislocation, physical therapy can strengthen thigh muscles so that they are able to keep the kneecap aligned. Pelvic stabilization exercises, which strengthen your hip abductors and flexors, can also be beneficial. Sometimes cycling can be a part of a rehabilitation program as well. In addition, a stabilizing brace can be used for symptomatic relief, and proper footwear can reduce issues relating to your gait. For chronic kneecap instability that causes significant pain and recurring dislocation, it may be determined that surgery should be performed. Procedures involve realigning and tightening surrounding tendons to keep the kneecap in place, or releasing tissues that are pulling the patella off track. For more information on patella subluxation, or if you are experiencing any kind of knee pain, contact Castle Pines Physical Therapy or Cherry Creek Physical Therapy today. We can help you get back “into the groove!” Make an appointment with Dr. Jennifer Molner, DPT by calling (303) 805-5156. You can also reach us online or at our locations in Castle Pines or Denver, CO.